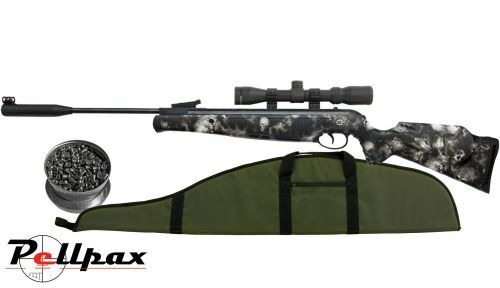 This kit comes complete with 3-9x40 scope, domed pellets and padded gun bag. The Reaper kit from Pellpax is chambered in the larger .22 calibre making it the perfect hunting rifle for vermin and pest control be they feathered or furry. The gun is equipped with fibre optic sights, moderator and automatic safety. The gun features a durable synthetic stock and is furnished in a fearsome skull camo. Add this item to your basket & spend an extra £235.01 to apply for finance.